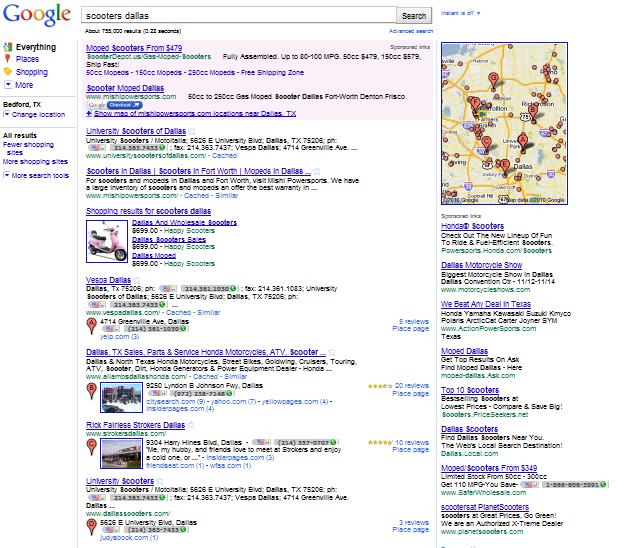 Home » Local Search » What Does Google’s New Place Results Mean for Your Business? 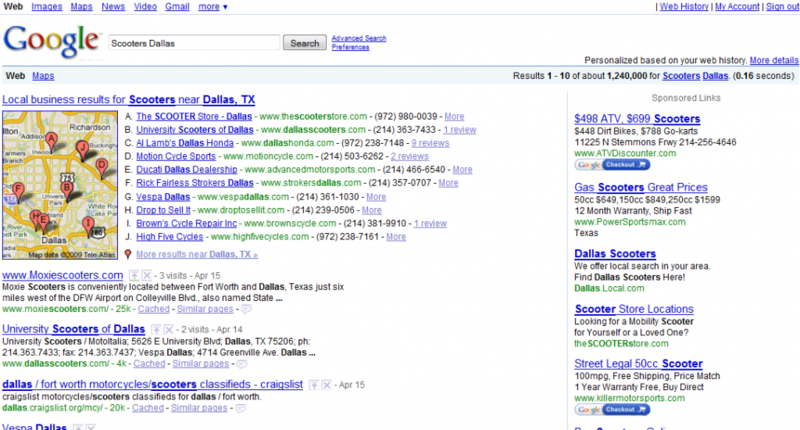 Prior to the launch of Place Search, a Google search for “scooters Dallas” delivered results that included sponsored links, the “Onebox” (also referred to as the “10 pack”) of local results with the corresponding map, followed by the top 10 organic results. Current search for "scooters Dallas" displays Local Map on the left hand side of the page and includes Place Results in the organic results. The Google map featuring local businesses now appears on the right hand side of the page (previously the sole dominion of sponsored results) and remains on the screen at all times. If you scroll down the page, the map appears in the same position in your browser and moves over the sponsored ads as you go. Google's new Local Results are eye-catching and informative. If you haven’t already claimed your local business listing and optimized it, now is the time to do it. Here are some considerations to keep in mind as you undertake the process. Links from directories and other local businesses help validate your location and improve your relevance for local searches. You should list your business wtih as many of these sites as possible. Fortunately for this restaurant, Google features a snippet from a positive review scraped from Citysearch. Since local results include thumbnail images, you should give some serious thought to the images you upload to your local business listing. Images with a lot of fine detail will not translate well as thumbnails, and users are far more likely to be drawn to images of your products than images of your storefront. Image "F", on the left, tells you nothing about this Mexican restaurant. Image "E", on the right, is much more appealing but fails to take advantage of the entire image frame. For many small to medium sized businesses, the prospect of optimizing and monitoring their local listings will be an overwhelming drain on their time and manpower. For them, now may be a good time to contact a local SEO / SEM firm to discuss their needs. With the increasing emphasis on local search, more and more SEO / SEM firms now offer local search optimization services designed to help these smaller enterprises compete on the local level. We would love to hear your thoughts on Google’s new Place Results. Please post a comment below.